2014 in review Happy new year 2015! Sisteron is situated at the foot of a deep gash in the rock created by the river La Durance , has always been known at the natural getaway to Provence, even by the Romans. The old part of Sisteron is characterized by the twisting alleyways and houses with tiled roofs that are very typical of this part of France. There are numerous small squares with fountains and the trees provide a very pleasant shade. Another aspect to this small town is that Sisteron possesses one of Europe’s large abattoirs ( slaughter houses) for sheep and lambs. In peak season 2,000 animals are slaughtered here. In the Hautes- Alpes, the blue sky often merges with the green of the pastures. The meadows are covered with white, peaceful looking flecks , resembling little stars. A flock of around a hundred sheep grazes all day long on the thyme- filled grass. The lambs are scarcely more than a few days old when they accompany the flock up to the Alpine pastures. During the first three months of their young lives, they go up the high plateaux, feeding on their mothers’ good milk. The milk owes its special quality to the wild herbs contained in the aromatic Alpine grass that the ewes graze on. 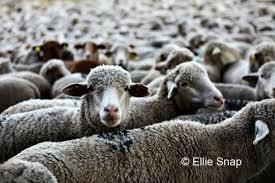 The Prealpes breed of sheep has a somewhat elongated head, long, thin legs and produces only a small amount of wool. The quality and the tenderness of the meat produced by the lambs, however, are such that its fame extends, far beyond Provence’s borders. A Sisteron lamb label does not exist as such, but meat from local animals, which have been bred accordingly to traditional methods, fed naturally and allowed to graze freely is given a red badge. The best way to appreciate the meat, which is virtually fat -free and tastes slightly of filberts, is to compliment it with a red wine from the south or southwest of France. 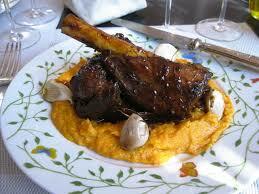 For the traditional Easter lamb, a leg of lamb is roasted with rosemary, thyme, garlic puree or a clove. Beans are also a typical Provencal accompaniment. The Sisteron lamb is amazing and very tender, I got to taste it at a very well known restaurant ( La petite maison de Cucuron) in Cucuron. 3 cloves garlic, 2 Tbsp ,olive oil. Salt and fresh milled pepper. Preheat oven to 480 F /250 c. Peel garlic cloves and slice. Make cuts in meat in several places, and insert the slices of garlic into the cuts. Rub lamb lightly with oil and place in an oiled roasting pan. Add a glass of water & the sprigs of rosemary. Season the meat with salt & pepper then cook in the preheated oven for 15 minutes. Reduce oven to 400 F / 200 C and cook the lamb for 25 minutes or more until ready. * Carve into pieces and serve with a traditional accompaniment of fresh green beans garnished with chopped parsley. In Provence we celebrate with a Pastis, Part 2. How the traditional Pastis is produced. During the middle ages, traveling apothecaries used to visit the Lure Mountains around Forcalquier to stock up their supplies to stock up on their supplies of medicinal plants which they would usually distill. During the 17th and 18 th-centuries , their descendants settled in the surrounding towns and also opened herb stores. During the 19th-century , the original apothecaries had evolved into pharmacists, schnapps distillers, and, by the 20th-century, liqueur and aperitif manufacturers. Today’s pastis manufacture is a legacy of that tradition from the Lure mountains. The history of “Provence’s distilleries and estates ( distilleries and Provencal domains) includes the true story of one man’s affinity for the mountains and plants of his native land. Henri Bardouin was born in Forcalquier in 1908, he was fascinated by medicinal plants that grew in the region. He used to enjoy trying out fresh combinations of herbs and spices. He really loved his job as a distiller and put the skills handed down from his forefathers to good use in his work. Today the Henry Bardouin is one of the best traditional pastis, in other words, done the traditional way. The mountains of Forcalquier boast 1,700 species of wild plants – A true heaven for herb collectors. Some of the flowers and herbs used in pastis are gathered here, although precisely which ones remains a guarded secret. The traditional pastis flavor comes from a collection of over 50 plants and spices. The various stages in its manufacture must be followed religiously and meticulous attention is paid to the exact quantities of herbs used. also it is essential for certain combination of herbs to be steeped together. The plants are left to infuse in alcohol for about two to fur weeks. Then they are pressed , and the essence is combined with the distilled solid residue. Knead all ingredients together and roll out the dough to a thickness of at least 1/4 inch thick. Cut out small circles and bake at a low temperature ( 325) in the oven for 12 to 15 minutes. In Provence we celebrate with a Pastis, Part 1. In Forcalquier, a small village built on a hill between the high plateaux of the Luberon and the Lure mountains, and the Durance river. Forcalquier is an appealing little town, steeped in history. A brief history of Pastis. While there is nothing absolutely wrong with Kir, one thing is certain : whether you are on the south coast or in northern France, pastis is the most typical aperitif found in French Bistros. And rightly so , if you consider how much this drink has had to endure to gain its place at the bar. Two hundred and fifty years ago, a liqueur called “Vinum Silatum” was created from fennel and wormwood (absinthe) to quench the thirst of folk in the Mediterranean region. It most recent history begins in 19th -century France. In 1805, Henry-Louis Pernod, a distiller, settled in Pontarlier, near the Swiss frontiere. Each day, his distilleries produced around four gallons ( 16 liters) of a herb-based spirit with a very high alcohol content. The drink which became very popular and was known as La Fee Verte or Absinthe. During the Colonial wars in 1830, absinthe was handed to French soldiers suffering from dysentery. The drink had a medicinal effect and it also helped with the soldiers’ thirst and helped them to endure wars. Drinking absinthe entailed a very special ritual which further enhanced the experience. Water was added to the drink and it trickled through a crystal containing absynthe, which gradually turned cloudy and lost its greenish tinge. From around 1860 onward, absinthe began to gain a lot of popularity amongst workers and artists alike. It 72 percent alcohol content made it a very potent brew, often with devastating consequences. Alcoholism increased and had inspired no lesser men that Paul Verlaine, Arthur Rimbaud, Vincent Van Gogh and Pablo Piccasso, fell into disrepute. In 1915 , absinthe-based spirits were banned in France – A decision that embraced all aniseed-flavored alcoholic aperitifs. Distillers were extremely reluctant to accept this. They joined forces and after 5 years of protests, managed the government to revoke its ban on aniseed-flavored aperitifs with the proviso that no absinthe would be produced with an alcohol content of exceeding 30 percent. It was not after 1938, following long years of administrative and legal arguments, that pastis was again allowed but permitted an alcohol content of 45 percent. The producers were happy since this was precisely the right amount needed for the aniseed flavor to achieve its full potential. The story does not end there, however. Absinthe was to be banned once more. A century after being given to French soldiers, it was banned during world war 2 for undermining the troops’ fighting morale . The ban did not last very long and once again was being served in French bars. Pastis and its extended family. 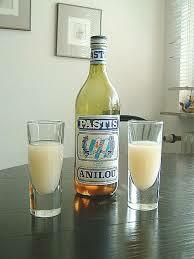 Pastis means mixture – the individual types of Pastis are the result of different combinations. It is why the individual aniseed- flavored aperitifs can vary considerably in taste. At the beginning of the 20th-century , a descendant of Henry-Louis Pernod opened distilleries in the Jura region. This is where Pontarlier was first produced, the father of an entire family of Pastis drinks. In 1932, Paul Ricard created his ” genuine Marseille Pastis”,” vrai pastis de Marseille” and in 1951, Paul Pernod entered the arena with his Pernod 51. As the number of new varieties grew, so,too, did the terminology surrounding the yellow drink, a command of which distinguishes the layman from the connoisseur. You first ask the barman for your usual brand, in other words, a Casa or a 51. If your bartender knows what you like , you simply ask for a glass of Jaune ( Yellow) or Pastaga. Then you have to refine your request : Flanc means neat Pastis with no water, momie means half measure of the desired label, and 102 means a double Pernod 51. The Pastis can be mixed with almond, peppermint, or pomegranate syrup or with a combination of all three. 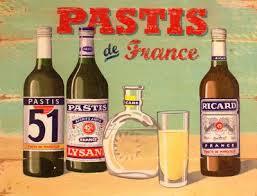 Whatever your choice ice-cold water is added to the pastis in the ratio of four (or five) to one.. The water releases the aniseed flavor and causes that milky cloudiness typical of this drink. Commanding the 35 percent of the domestic market is Ricard, the leading Pastis in France well ahead of Pernod and Pastis 51 ( 9.7 percent), Duval ( 6.5 percent), and Janot ( 0.3 percent). Those results also reflect the preference of consumers in the South of France for Ricard and Pernod 51 over all other available varieties. The numbers have probably changed in today’s world. Of Le Petit Jaune, available at French bars, only the Bardouin, Pernod, janot and crystal labels are 100 percent Provencal in origin. Cheers & Happy holidays and peace on Earth! Travel with us to Provence and book your trip in January 2015. $ 3, 990 per guest. The thirteen Christmas Desserts in Provence. 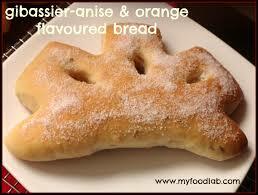 Le Gibassier, a yest cake with eggs, flavored with orange and lemon peel with some orange blossom water. They are supposed to symbolize Christ and the twelve Apostles at the last supper. They are the total culmination of what is definitely very much a very traditional meal. The differences between a Provencal Christmas table and what is customary in the rest of France are definitely noticeable in the table decorations. In Provence three white tablecloths overlap each other, symbol of the Holy Trinity. Candlesticks are the completion to a Christmas table arrangement. As far as the food, it is totally true to say that Provence is a country onto itself. Provence offers some traditional dishes such as a vegetable fondue with anchovies or dried salt fish, various Provencal cheeses, followed by cakes and fruit are definitely part of the Christmas table. They are accompanied by sweet dessert wines from Rasteau or a Baumes -de- Venise Muscat. But what is the real story behind the thirteen desserts which does not include cream and candies on the table. We will start with the four mendiants ( mendicant monks): raisins, the amber color of which is reminiscent of a Dominican monk’s habit, dried figs, almonds, and hazelnuts or filberts, symbolizing the Franciscan, Carmelite and Augustinian monks. 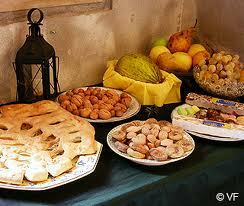 Then the fresh seasonal fruits, usually pears, apples, mandarins, or oranges, occasionally melons or grapes. Depending on the local traditions and of course of personal taste, these can be followed by nuts or dried other fruits, such as dates or prunes, possibly candied fruits and quince bread. Then the nougat, white and softer, followed by black nougat with its harder consistency, accompanied by a few calissons d’Aix. A very magnificent Gibassier provides the grand finale to this humble banquet. This is a yeast cake with eggs, flavored with orange and lemon peel and a little bit of orange water. 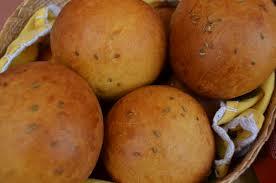 It is still as soft and sweet as in the days when the baker gave it to its customers as a seasonal gift. It is a tradition to break the Gibassier into pieces instead of cutting it. January is the month of honoring the three white men and once again, the festivities are accompanied by sinful sweetmeats. The Galette des Rois, or Epiphany cake is on sale in every bakery and often served with coffee or tea during a family get- together. Sometimes or even now days it is made with puff pastry and filled with almond cream, or it can take the form of a yeast cake filled with candied fruit and sprinkled with sugar crystals. The latter version is the one favored in the South of France. Tradition requires that it contains a lucky charm, such as a little porcelain figure depicting a particular trade or a biblical figure. Merry Christmas & peace on Earth from Luxury Travel Consultant2. 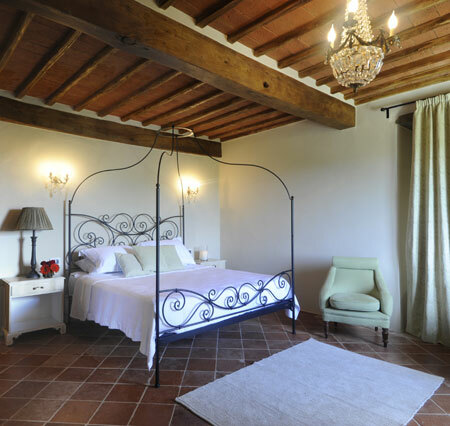 Anyone who has had a small taste of the sweet life in France and Italy has definitely fantasized about renting an estate in Italy, a chateau in the Loire Valley or a restored farmhouse in Provence . No hotel stay can really compare to having a grand European home of one’s own and filling it with great friends and family. Finding a home can be very simple but choosing the right one with the best value really takes some serious planning. First you have to decide whether you want to rent from an owner or an agency. From an owner the price will be lower but also higher risk. With an agency, the converse is true. With the rise of the Internet, renting directly from an owner has become much easier and more popular. Seasoned renters always go back to a familiar area. After paying a membership fee, owners will post their vacation rentals on the website of companies such as vacation rentals by owner ( vrbo.com) and also homeaway.com. Potential renters can find a gems, such as the perfect villa , one is a six bedroom 15th century house near Cortona with three living rooms and a large pool. This home is listed on vrbo and available at a very decent price!. Also do keep in mind that prices depend on the season. Removing a rental agency from the equation can reduce the cost up to 40 percent. Sometimes on occasion, individual owners might be willing to waive the week long rental requirement and allow a shorter visit. Keep in mind that only the owner’s word guarantees that a property is as described. Also the villa may indeed be a very lovely home, but also be in need of a deep cleaning or maybe close to a very noisy road. In contrast, the best rental agencies hire staff to inspect and choose the finest properties in the region. Also an agency will help renters decide what villa is best suited for their needs, considering children, pets or aging parents. Then, an agent is very useful in helping you choose the perfect place. If your villa is located not far from a church and that the bells ring frequently some people may see it as a downside. The best agencies will provide lots of material about a house as well as its neighboring villages along with restaurant, shopping and sightseeing information.. Also an agent can solve problems that are not uncommon with a 15th century chateau or rural house. France and Italy really appear to a lot of travelers such as the warmth of the summer season, the gastronomy, the wines and the sound of the language spoken with romance. I have read that Provence and Tuscany renters may bump into a lot of Brits and Americans which can reduce the immersive feel. When I take groups to France & Italy, we never bump into English speaking tourists and have local drivers & tour guides take us to very interesting spots!. 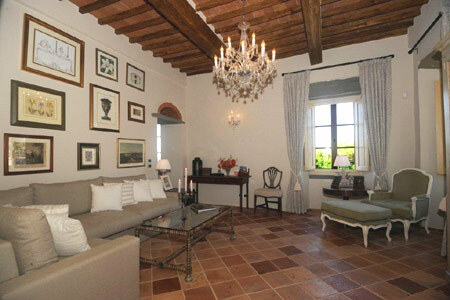 If you really enjoy authenticity renting a villa is a great choice!. 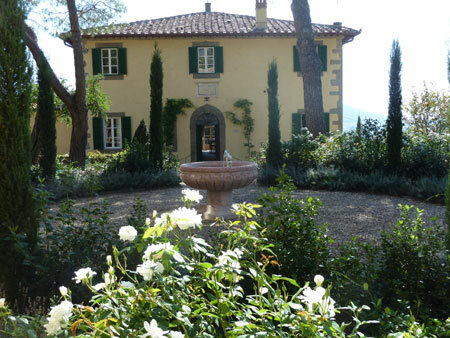 Books have been a great inspiration for travelers who love both the hill towns of Tuscany , thanks to Frances Mayes’s ” Under the Tuscan sun” but the adjacent rolling hills of Umbria and the wonderful cuisine is also very famous for travelers in search of the ultimate experience. Also most adventurous travelers won’t shy away from rural homes next door to Umbria. 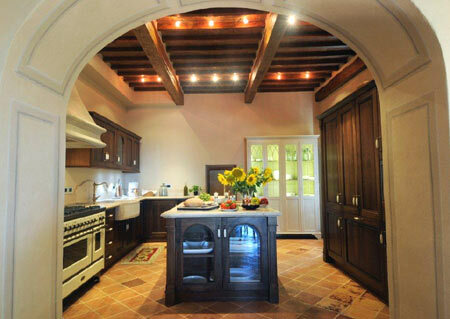 The classic destinations for villa rentals are Provence, Dordogne, the French Riviera. Languedoc -Roussillon in Southeast, France is starting to get more attention but is still a sleeper hit.Great food and very good wines from Marsanne, grenache and Syrah grapes. Also a lot of little towns and hamlets surround historic cities such as Nimes and Carcassonne. The best time to visit France & Italy is before summer and after summer. I will take groups in May, June, September and October. July & August are high season, so try to avoid the hordes of tourists heading down the coast ( Provence). Restaurant reservations, hotels are in full swing and it hard to walk on crowded streets . If you want to rent a villa , do it 7 to 8 months in advance. Also if your best choice is to be a little further away from the action, because there are many small towns and they never feel crowded, even in July or August. When renting always make sure that the sleeping arrangements suit the group. Every villa has its very own layout and if a property is listed as sleeping 10 guests, that does not mean that it translates into 5 bedrooms. It can be 10 individuals or 5 couples, also make sure there is a bathroom with each bedroom. Always make sure that the owner or agent describe the property while you look at the photos online. Every agency or owner must list the amenities such as Linens, washer & dryer access. In France & Italy a daily maid or gardener along with pool maintenance. Other services can include babysitting, concierge and cooks. Also remember as an American you can get used to certain comforts but when you are abroad some amenities can be in short supply such as window screens or air conditioning. Many pools may not be large enough for lap swimming. Sometimes internet maybe not available. Additional fees will be added for bicycle rentals, a stocked pantry or for fresh linens. You can also have a babysitter watch the kids and it usually runs from $20 to $ 30 an hour in France or Italy. A deposit is always required to secure a villa rental and payment in full is usually required 90 days before arrival, sometimes even often an owner or an agency will require a security deposit, sometimes they are not refundable. Do not forget to have insurance in case the trip is cancelled. ( Travelguard.com). Kate & Ted Smith , San Francisco.